One of the most expensive, misunderstood, and misused appliances in the typical RV is the gas/electric refrigerator. Let's take a look at how they work- what can go wrong- and how to keep from having problems. There are two basic systems to deal with in these types of refrigerators- the control system, and the refrigeration system (cooling unit) itself. The control system will be very different for every make and model of refrigerator, but the refrigeration systems all basically work the same way. First we will see how the refrigeration actually happens, and how to help your refrigerator work its best. When I first started Rving, I took LP gas refrigeration for granted, but after a while, curiosity began to take hold- how in the world can you put in fire at one end, and get cold out of the other? While I read and studied and kind of had an idea how it worked, I finally had the "epiphany" in a Norcold course, taught by Brent Grieves, a technical trainer/technician for Norcold, who explained it so that I could finally understand it. The refrigerant in LP gas/ electric refrigerators is ammonia- the oldest refrigerant used. In addition to the ammonia, the refrigeration system contains water, hydrogen, and an anti-corrosive agent. The ammonia stays a vapor, and rises to the condenser fins, at the top of the system 4- these are the fins that you will see if you remove the top vent over the refrigerator. The only purpose of this part of the system is to make liquid ammonia out of the ammonia vapor- the more liquid ammonia it can make, the better the system will cool, as pure liquid ammonia is the heart of the cooling cycle. While I have left out some steps- this is the basis for gas fired refrigeration .. so... We can see that the three basic requirements are the proper amount of heat at the boiler, a good air flow over the condenser fins (and absorber coils), and the real kicker- gravity (down has to be down). While most modern RV refrigerators will adequately somewhat off level (the popular recommendation is that if it is comfortable to walk in your rig, it is good enough for the refrigerator), they will still work better and last longer the more level you make them. So .. to applying this knowledge to troubleshooting a cooling problem (as opposed to a control problem) is fairly easy- start by leveling the rig, next carefully check the venting, both upper and lower, to make sure that the air flow is unobstructed, and finally, you need to apply a set amount of heat to the boiler. The two ways that heat is applied are by an LP gas flame, or by an electric heating element. Because the LP flame is so small (~1500 BTUs average), it is very difficult to determine if the flame is the right size, generating the correct amount of heat. Fortunately, because of an electrical formula named Ohm's law, determining the output of a heating element is easy, so this is the method that we use. You need to know the voltage rating and the wattage rating of the heating element - you can find a chart here (link coming soon) - (which will actually give you the resistance value- cheating! ), square the voltage rating (example, if the element is rated at 120 volts, multiply 120 X 120 = 14400). Next, divide this sum by the wattage rating (example, if the element is rated at 300 watts, 120 volts, divide 14400 by 300 for a result of 48). This result will be the resistance of the element- in the example the resistance is 48 ohms. So- if you disconnect the 120 volt heating element, measure the resistance, and it is within +- 10 % of the value you came up with, and if you measure the supply voltage, and verify it is within 10%, you can hook the heater directly to the supply power (bypassing the controls) and know that you have applied the correct amount of heat the the cooling unit boiler. This is, in my opinion, the only way to determine if there is a problem with the control system, or the cooling unit itself. After you have done this, wait at least 12 hours, and the freezer should be near or below zero, and the fresh food compartment should be near or below freezing. The only caveats are that if it is very hot, and the refrigerator side of the RV is in the sun, it may take a little longer to cool this well, and if it is extremely hot (the south in summer), and the area around the condenser coils gets above 110ï¿½ - 120ï¿½ or so (which, in the sun, isn't that hard to do), the condenser will not be able to make enough liquid ammonia to adequately cool the "box" (but- before you condemn absorption refrigerators- virtually no modern refrigerator will cool if its' condenser temperatures are above 130ï¿½). With the proper ventilation- enough air over the condenser coils to make liquid ammonia, if the unit is level, and with the correct amount of heat applied to the boiler, unless the cooling unit is bad, it will cool. A couple of tips- if the refrigerator has been working, and it suddenly stop cooling, turn it off for one to two hours, re-level the RV, and turn it back on. 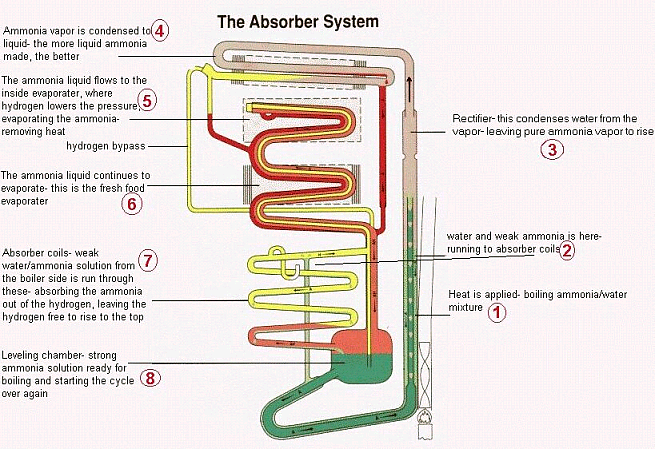 Sometimes the flow of ammonia can become "vapor locked", and turning it off will allow the pressures to equalize (the old method was called "burping", and consisted of taking the refrigerator out of the coach and turning it upside down.. newer models- built since the early 1980's, do not need this, nor will it help). A venting tip is that there is a minimum clearance at the back of the refrigerator. If the back wall is more than one inch away from the refrigerator coils, an added baffle will greatly improve the efficiency, because a large gap will allow the air drawn in by convection to bypass the coils, but if you put a baffle in to force the air to pass over the coils, the refrigerator will cool much more efficiently.